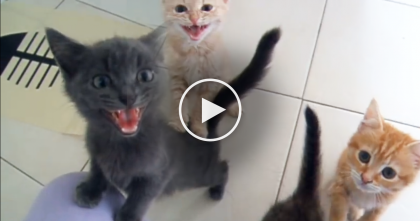 Dog Gets Pranked By Cat, LOL… Just WATCH This Adorable Trickster Get Away With It! George the Cat, as he is affectionately called, is depicted as the mastermind behind a harmless prank played on the dog, Banana. LOL! George is shown filling Banana’s food bowl, then tying it to a rope outside which he flings over a tree limb. Once Banana smells the food outside, he runs out excitedly! But WAIT! The food dish soars high up into the air and dangles there, tantalizing the unsuspecting pooch! …George sneaks back inside unnoticed. 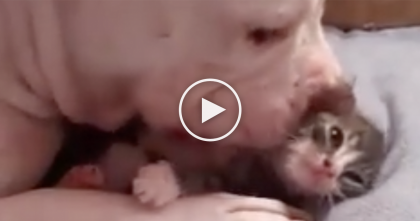 Bit Bull Discovers This Little Kitten, Now Watch What He’s Doing… Sweetest. Thing. EVER. 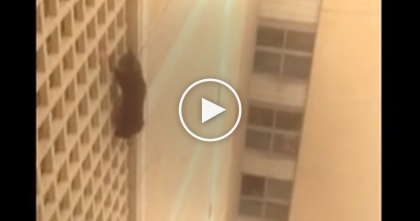 Cat Is Paralyzed With Fear On Seventh Floor Of Building! !….But Students Make A Daring Rescue! 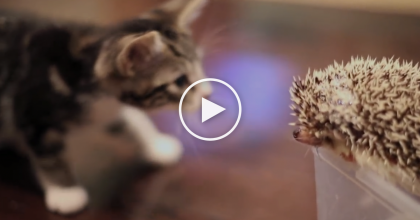 When These Foster Kittens Get Hungry, Just Watch And Listen… Your Heart Will Melt, ADORABLE. Sleepy Kitty Just Can’t Help But Give Owner A Hug In The Cutest Way EVER… Oh My Heart! !